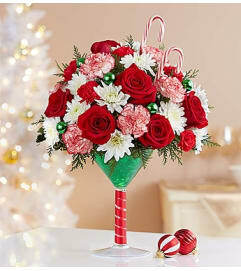 Red Rose, Red and White Carnation, White Cushion Pom, Myrtle, Assorted Christmas Greens. Please note products may be substituted if it is not available. I appreciated the phone call to discuss the change in color. I have not seen the arrangement but he said it was beautiful! Thank you for helping make his day special. Easy to order and the flowers were gorgeous!! No delivery fee when you order online!! Next day delivery was offered! 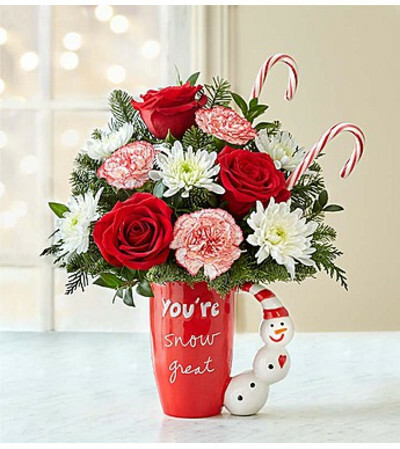 you did a great , awesome , beautiful arrangement . our team thank you. 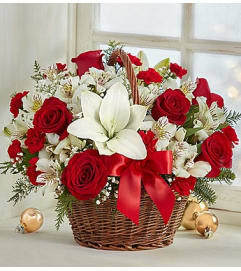 Lynette's Flowers & Gifts is a Lovingly Florist in Ontario. Buying local matters. Discover how Lovingly supports local florists. Copyrighted images herein are used with permission by Lynette's Flowers & Gifts.